Power For Today Magazine, a monthly magazine for understanding our lives and times, is published monthly and is a publication of Apostolic Fellowship International Ministries. 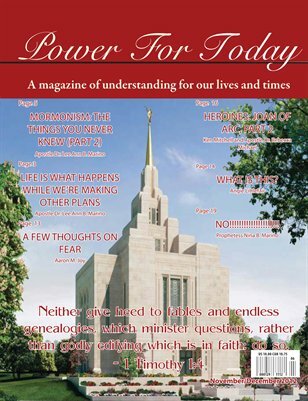 November/December 2012: "Mormonism: The Things You Never Knew, Part 2." Join in this intriguing look into the Church of Jesus Christ of Latter-Day Saints and their theology, philosophy, history, and social impact.